To give news of the meeting to those who cannot come to Berlin, this page provides a short review of each day’s activities during the meeting, with articles by young people who have come to Berlin from throughout Europe. The Berlin meeting is over... and now everything begins! Almost a week after the meeting, the young participants are back in their countries. the "Messegelände" is no longer decorated for worship; daily life in the parishes and families has begun again. Enriched by the experience of the meeting, can the people of Berlin and the young pilgrims now bring something back to the places in which they live? During these days, a group of Taizé brothers, sisters of St Andrew and young volunteers are still in Berlin to thank all who opened their doors. On January 15 there will be a final prayer in the Marienkirche, the place where daily prayer was held during the time of the preparation. Many young people these days are expressing their gratitude for having been welcomed in the city of Berlin, as shown by the testimonies we have received these days. Here are some of them. The European meeting in Berlin was a very special event in this year and a great enrichment for me and certainly for everyone else. It is indescribable that so many young people who never saw one another before could come together in peace to begin a new year with God at the center. I am already very happy that the next meeting will be in Rome. During the meeting we sang in one of the choirs in a hall and thus supported the prayers with our voices. After three days of rehearsals from December 26th on, we experienced the celebrations very intensely. This experience is in fact a way to be active during the celebrations. Bonus: the smile and the energy of our choir directors, the problems with microphones, the improvisations of the soloists and the surprising starts! I was very enthusiastic about the volunteers who distributed the meals or stood in the railway and metro stations and were there to give directions in many places throughout the city. They were always friendly and created a beautiful and unique atmosphere. During the meeting I thought more and more about the song with Dietrich Bonhoeffer’s words, which says: “Ich verstehe deine Wege nicht, aber du weißt den Weg für mich” - “I don’t understand your ways, but you know the way for me”. We didn’t know where we had landed in coming to Berlin, but God knew the way and we discovered it little by little. Every morning I participated in the prayer at the Messegelände. It was a time for me to pray with the people I would work with throughout the day – to spend time in silence and to reflect on the themes of trust in God and amongst people. During the meeting I was not able to participate in a daily program in a Host Parish, but these prayers have been a way to be united with all the young people who have come to Berlin to participate in the meeting. It was a powerful experience to be praying in the Messegelände and to think of all the Host Parishes having similar prayers throughout Berlin – a symbol that though prayer Christians are united in Christ. It is nice to know that at the start of a new year, thousands of young people are continuing to trust in God and to connect with their churches and communities in their home cities – this is something that inspires me and gives me a lot of hope for the coming year. During the meeting I took part in the workshop “For a more just world,” where we young people had the opportunity to enter into dialogue with politicians. First there were some introductory words by the vice-president of the German Parliament and then statements by three young people from China, Ethiopia and Berlin. Among the important points were, for example, that though impatience and dissatisfaction are part of democracy, much patience and tolerance are necessary to come to an agreement and make decisions. I feel confirmed in a desire to become more committed and to motivate people to live more aware of their responsibilities. Today I participated in the workshop which took place in the Bode Museum. Many pieces of art in this museum are connected with the region. First of all, I was a little bit confused because the museum was so big so I didn’t know where to look. Then, I concentrated on some halls which attracted me the most. In one hall, I was impressed by some of the old wooden sculptures like “Christ on the cross” from the 12th century and the wooden relief “Angel with a dead Christ” from the 14th century. There was so much feeling in those pieces and the old wood made this impression even stronger. Today, the young people who took part at the 34th European meeting are preparing to return to their country. During the festival of nations last night, they all passed the new year by praying for people who are suffering and shared the joy of being together, in communion with God and with each other. At Potsdam, young people prayed for the Congolese people – one of many examples of prayer intentions that make those who express them more aware of their responsibility in this world. This morning, the parishes hosted the participants for Sunday worship, including the Orthodox communities that had the opportunity to welcome young people from Russia, Ukraine, Serbia or Romania... At noon, the host families saw the young people again for Sunday lunch... very international. Then the time had already come to say goodbye; the buses had to leave Berlin and head in all directions beginning at 4pm. The young participants and their host families said goodbye, but often with a sense of mutual belonging, thanks to this provisional communion for a few days... called to last. During this meeting in Berlin I got the chance to experience how time can bring change for those who keep on trusting in a better world. One of the feelings that is at the core of the human condition is hope. Today, in Berlin, we can experience the results of many years of hope for a better society, for a more united human community. Trust needs to be refreshed, renewed from time to time. This meeting in Berlin did not leave the local parishes indifferent, but renewed their trust in a communion with God. I believe that every soul is touched by the love of God. By knowing what our heart truly thirsts for, He finds the ways to break through our spiritual boundaries and build bridges by which we get connected to the Lord. And the only thing God asks from us is an open heart, courageously willing to live in love. Words that strongly invite us to remain courageous were spoken yesterday by Brother Alois: “There is a Love that is beyond us.” So, let us not be afraid! Towards a new solidarity, beginning in Berlin! Today was the last full day of the meeting. For the last time, the small groups shared on the Bible reading and on the Letter 2012 by Brother Alois. Then, in the afternoon, the meetings by country brought together everyone before the final prayer together. In the evening, the pilgrims go to their host parishes for a prayer for peace, followed by the festival of nations with all the participants and their hosts. Berlin is a city marked by a great diversity of cultures, nations, ways of life and religions. As a brothers said in his reflection during the midday prayer today, it is the calling of Christians not to remain among themselves, but to cross borders and go towards others. The salt of the earth is not useful when it remains in the salt-shaker, but when it gives taste to the whole of society. In this way trust between people can grow, the first step towards the “new solidarity” that the Letter 2012 of Brother Alois calls for. Being welcomed by the city of Berlin – by women and men of all horizons, as the workshops in the synagogue and the mosque showed – can already help us to find that trust. We are welcoming a few Byelorussians in our parish. The first day, during morning prayer, a girl from their group sang the Gospel in her language. This morning, the group sang a Sviaty Boze from their tradition, in three voices and a cappella. For the festival of nations, they even brought puppets for a play. We are happy to find such diversity among our guests from many different countries. During the difficult times of the separation of Germany, it was hard to practice one’s faith and to remain hopeful in the East of the country, in which it was dangerous to disagree with the regime. More than 130 people were killed trying to flee. And yet, women and men did not lose their hope and their faith, even in those dark times. The sculptures of Ernst Barlach placed in the prayer-halls are a sign of that faith and of the desire for a future of peace. But, thanks to the falling of the wall and the reunification of Germany, Berlin has become a symbol of reconciliation et of peace. Today, a new era has begun in the life of the city. The reunification of Germany was made possible only by the peaceful movement of indignation in 1989. As an echo of this history, during the meeting young people discussed the question "Indignation, passivity or commitment.... the place of youth in today’s society," and they met with politicians in the German Parliament. The revolution of 1989 is a model for the active participation of Christians without violence, in peaceful communion in resonance with society. We appreciate all the meetings and conversations with the inhabitants of Berlin. It is wonderful to listen to their stories about the city. It was beautiful and touching for us to hear the sister of our host parish say that we participants are enriching for the Berliners and a sign of a united Europe, right here in a city of separation and reunion. In the multicultural city of Berlin, this meeting is also an outreach to non-Christians. The day before yesterday, in the Jewish Museum, we learned about Jewish traditions which obviously have close relations to those of Christians. Then, yesterday, in the Şehitlik Mosque, we were greeted with the words “Welcome, brothers and sisters!” Young Muslim believers shared their thoughts on religion in general and said that it is always about peace. They said that we are all guests in God’s house, in a mosque or in a church. The strange faces of yesterday became unexpected friends and warm hosts. As the fear of the unknown starts to fade away, the joy of discovery develops. Today, the young pilgrims in Berlin filled local churches throughout the city once again. After morning prayer in local parishes, pilgrims went to Messegelände for a lunch that, by now, is familiar to all. The food, the circulation from the distribution hall to the eating places, finding a place to sit and eat with a spoon, all of this is no longer a strange process. Then the midday prayer takes place, at the end of which a brother gives a small introduction about the reading. In the afternoon the second round of workshops, more than fifteen scattered throughout Berlin, took place. Many subjects, from politics to volunteering and including music, history and religion. And tonight, in the evening prayer Brother Alois announced four important new stages in the pilgrimage of trust on earth. It was so surprising and joyful to discover that the 35th European Meeting will take place in Rome next year! After so much time since the last Meeting in 1987, now, almost thirty years later, young people from Europe and from all over the world will meet at the shrine of Peter the Apostle, to discover again the sources of trust in God and the roots of our faith. The same trust and the same faith, even if human and imperfect, that brought a simple fisherman from Galilee to Rome, the heart of the Roman Empire, to become a witness of the love of God giving his own life in the name of Christ. I hope that all the pilgrims who will join the meeting, seeing and living the witness of the early Christians, can become sources of trust in God in their daily lives. As a Roman and as a volunteer (both in Taizé and here in Berlin) I will work during this year to prepare the meeting and give the best welcome to the thousands of young pilgrims, opening our homes and our churches, ready to share with them this stage of the pilgrimage of trust on earth. See you in Rome! One thing in particular I shall take with me from this Taizé gathering. In each hall the “Stalingrad Madonna” drawn by a German soldier in Russia in 1942 is shown; a beautiful, humbling drawing which portrays the natural relationship between a mother and child, and how compassion and love can be found even in the darkest moments of history. Simple, trusting and centered in love; it is a symbol of our relationship with God and of our communion with each other. In this city, full of memories and hope for the future, this is a brief moment to think, to pray and to dwell on relationships. Along with thousands of others, I have experienced communion and time to simply be with God. And it does not stop here. On returning home I know I shall carry the peace and hope with me, along with the trust and joy of the Madonna. After the journey and the welcome in the parishes, pilgrims and host families finally meet. After a night of sleep, the first morning prayer has taken place in the parishes. 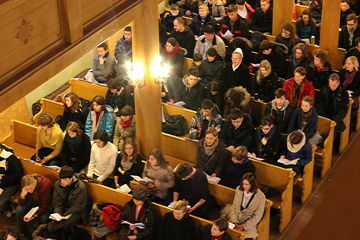 Local churches received a flood of young people from all around Europe. The faith of these young people that was present today in parishes all around Berlin represented to them a sign of hope, and also the accomplishment of the past months of preparation. After the morning prayer, small bible reflection groups were formed where different views and experiences were shared. In the afternoon, more than fifteen workshops could be found in several places in Berlin. We were welcomed by Georg, our host, who lives alone. He agreed to welcome young people because he saw an advertisement in the metro saying: 2m2 = one young person hosted. The size of his little apartment is inversely proportional to his generosity. Every morning, he brings us hot chocolate in bed to wake us up, and every evening he welcomes us back to his house with a warm smile and something to eat. We exchanged a lot about life here in Berlin. What more to ask from a host? The meeting begins! 30,000 young people from across Europe and even from other continents are together in Berlin. Because of the large number of pilgrims, welcome areas were scattered throughout the city in different schools. Thus, everyone could be welcomed in their own language. Already today, we saw many groups of young people, signs and flags in different places of the city. Although Berlin is a very large city where many activities take place, one can easily imagine that behind the facades of many houses and churches, there are families and congregations welcoming young people they do not know into their day-to-day lives. This creates quite a different atmosphere. Women and men commit themselves to make city life more human and to come closer to one another. After the first welcome in the city center, the participants went to the parishes and to amilies or in group accommodations. In the evening, everyone gathered for supper and evening prayer. In the train to the exposition center of Berlin, suddenly a man with two dogs sat down in front of me. Spontaneously, I wished him “Merry Christmas” and he asked me whether we knew each other. When I said no, he was pleased that I had wished a stranger Merry Christmas. First, we talked about the two dogs, and later, he asked where I wanted to go. When I told him about the meeting, he told me enthusiastically that he was a member of one of the participating free churches himself and that he also would welcome some guests at home. I shared a bit more about Taizé and my life there until finally, at the central station, we both went our own ways. 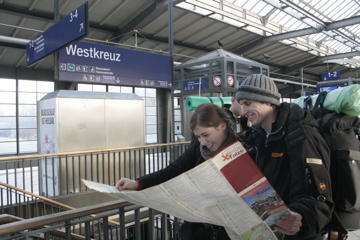 On the platform, I saw the first young people studying the maps which Taizé distributes at the welcome. And then I knew: Now, it´s really beginning! What joy to see a familiar and welcoming face! When I arrived in Berlin it was a real homecoming. Then I took part in the preparation of the prayer places in the Messegelände, to welcome in my turn the participants in the meeting. I hope that each person will feel welcome and will find a warm smile. Today, in the place of welcome where I was working, fourteen teams of young volunteers began work at 6.30 am to welcome more than 2500 Ukrainians and Belarussians. The atmosphere was quite stressful as most of the participants had been travelling for two or three days. Despite being tired, the young people were very enthusiastic and by 12 o’clock all the work places had been filled. While many young pilgrims are already on the road and thousands of young people will leave for the capital of Germany tonight and tomorrow, the last details for the meeting and preparing for the welcome continued with the volunteers who arrived yesterday. The choir and the instrumental group started to repeat the songs for the common prayers. A team of young people and brothers is taking care of the design and installation of technical equipment in the four halls where the common prayers will be held during the meeting. To make them more accommodating and warmer, large pieces of orange and beige fabric and icons have been placed in them, with a copy of the Stalingrad Madonna and Child drawn by a German soldier. On large columns in the middle of the hall will be projected themes of three sculptures by the German artist Ernst Barlach, describing three moments in the life of Jesus. During the time of the separation of Germany when, in the East, it was difficult, even dangerous, to live out their faith, believers continued to pray thanks to these sculptures. In this context, they become a symbol of faith and trust in the circumstances of life, even in suffering. Tomorrow, twenty-two years after the fall of the Berlin Wall, the young people and the brothers will pray before these icons as a link to the history of the host city. After three rehearsals, a room that started out full of strangers has now become a choir! Yesterday when one of the sisters leading the music asked what nationalities were present, there were cheers for the Italians, for the Germans, for the Slovenians … and then also for singers from Vietnam, Korea, Australia and Japan! Now we all sing together, and we are reminded of our different backgrounds only when somebody steps forward to help with the pronunciation of the words in a song. We have sung in Polish, Lithuanian, and Dutch, just to name a few languages. And we sing together! This is a transformation that happens at every European meeting, I’m sure, but nevertheless it’s a little miracle. Tomorrow we will take all the songs into the halls prepared for the prayers. 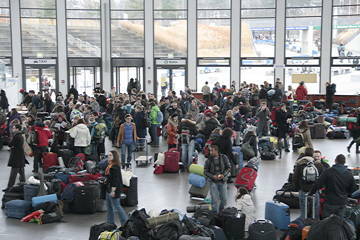 During the day, over 1500 volunteers who want to help welcoming all the young people already arrived to Berlin. From the early morning on, they have been welcomed at the Messegelände (exposition halls). In one of the smaller halls, two prayers took place with everybody. 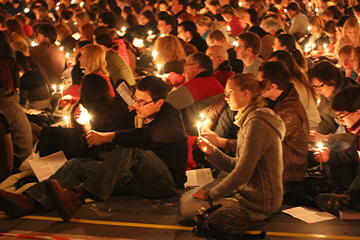 It was a pleasure to see that – above all at Christmas time – many people set off to renew and refresh their faith, their communion with others, trust and joy. In this way, these days of preparation can already give a first taste of what will be happening during the next days. Today, we prayed especially for the victims of the attacks in Nigeria and the floods in the Philippines as well as for peace in the Middle East. From the beginning, we want to gather without forgetting the trouble in the world around us. In this way, our meeting can be an intensive time of prayer and silence and at the same time a joyful gathering and a feast of peoples. After three months of preparations, we are happy that the meeting is finally about to begin. Today, at the end of the worship, one more lady said she was ready to welcome some young people for the meeting. We will receive 100 pilgrims in our parish, the Genezarethkirche at Berlin-Neukölln. The whole preparation team will meet tomorrow for the last preparations : setting up table and chairs for the welcome, making sure there will be hot drinks, decorating the church and preparing the posters so that the participants find their way from the metro to the church. Then on the morning of the 28th, everything will be ready and the adventure can begin. For the brothers, and for the young people who are working to welcome people in Taizé, Christmas was a pilgrimage: an inner journey undertaken with Christians from across the world to return to that wellspring of the faith which is the Feast of the Nativity – but also, with those who are preparing to take part in the European meeting, a journey to the city of Berlin. Tomorrow, Monday the 26th, the volunteers who will come two days ahead of time to help out will arrive in the German capital. The central site of the meeting – the exhibition halls, in German ["Messegelände" – will welcome this first wave of young adults. Brother Alois and many brothers will arrive throughout the day, joining the preparation team which has been in Berlin since September. 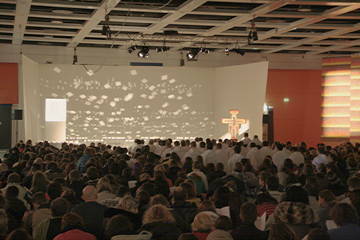 If you took part in the Berlin meeting and you wish to propose a text or a drawing for this page, contact echoes taize.fr.